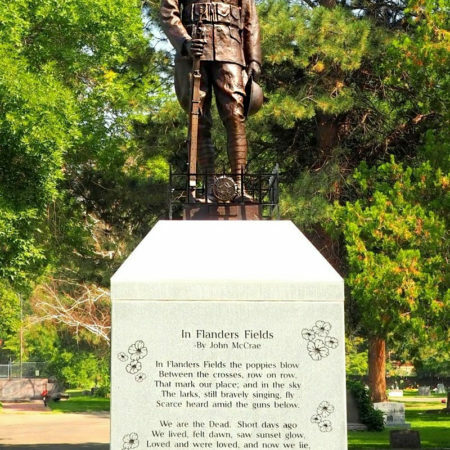 An unveiling ceremony for the restored Doughboy Memorial will be held at 2pm on Saturday, November 10, at the memorial location on Gold Star Drive in the Ogden City Cemetery off 20th Street, in time for the 100th anniversary of the signing of the Armistice that ended WWI. Mountain West Architecture of Ogden, Utah, is proud to have teamed up with the Weber County Heritage Foundation in restoring this important Ogden landmark. Special thanks to Connie Cox and Bob Gier of the Weber County Heritage Foundation for their tireless efforts. Also, big thanks to Wadman Corporation (and Dean Calcut) for their work on this project. 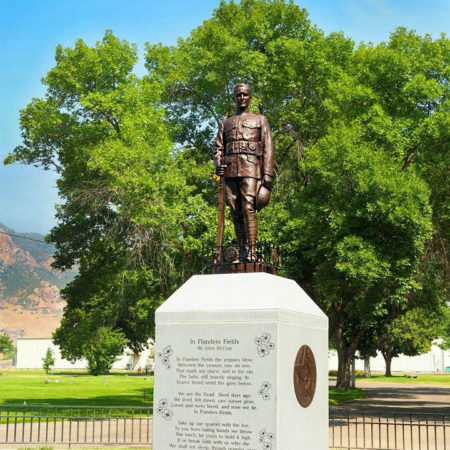 According to Connie Cox, President of the Weber County Heritage Foundation, restoration of the Doughboy Memorial was nearly a decade in the making. 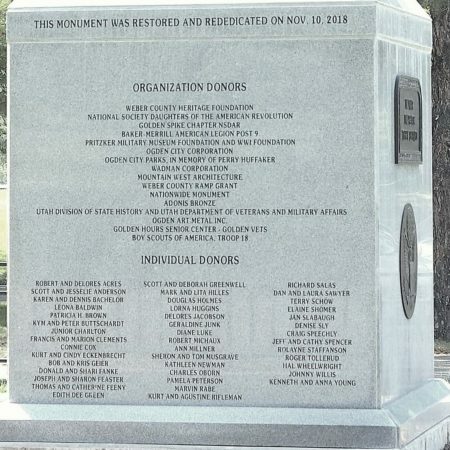 The first phase was the renovation of Gold Star Drive which included installation of markers and planting of trees, one for each of the Weber County soldiers lost in WWI. Phase two involved restoration of the statue itself which had fallen into a major state of disrepair. Over the years, the helmet had been stolen, the barrel of the gun had been bent, and well-meaning “helpers” had attempted to make it look better by spray painting it, causing further damage. To honor the American “doughboys” of WWI, many cities across the nation erected statues and monuments. 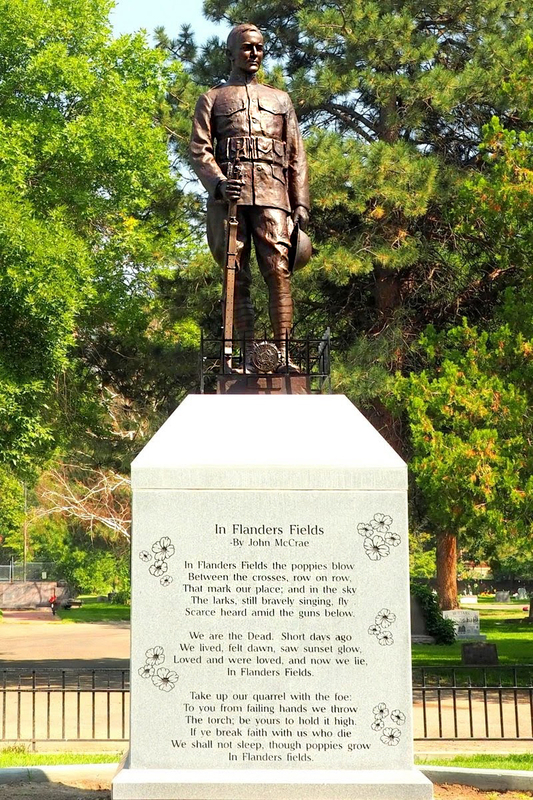 There are several in Utah, and the first was erected in Ogden in 1920, sculpted by Gilbert P. Risvold. The renovation of this important historic memorial was funded by national, state, and community partners including the National Daughters of the American Revolution. You can find out more about the Doughboy Memorial project and more by visiting the Weber County Heritage Foundation’s website. Mountain West Architecture offers the highest quality informed design services in the mountain west region. The company mission is to provide superior regional design services coupled with excellence in client satisfaction. To see more, be sure to check out the firm’s project portfolio.